Today I want to talk about one of my favorite things that come up in my interviews on KirstyTV. 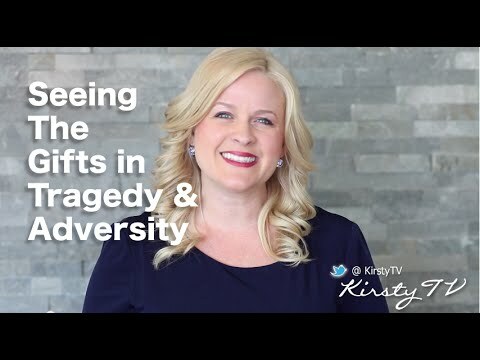 It’s something that initially surprised me quite a bit; that all my guests, no matter how much trauma they’ve been through, were able to overcome adversity and now see their tragedy as a gift. They saw it as something beautiful that happened in their life that made them who they are today. Stronger, more empathetic. It was quite incredible because some of the things that my guests have been through were really dark. Petra, for example, a victim of human trafficking and raped by over 40 men for 3 days, shared with me that she had to change they way she felt about it. Overcoming adversity is a life changing, character shaping experience. Positive thinking is a crucial tool you can use to overcome anything! I hope, that no matter what you’re going through, you get to a place where you see it as a beautiful gift in your life. Continue watching my guest’s full interviews: Chappale who witnessed his mother’s murder, Petra who was human trafficked, Peggy, who lived life as a little person, and Lauri who suffered extreme child abuse. I’ll see you later and remember, sharing our stories heals ourselves and heals others. Thanks to our wonderful sponsor, mantraband.com/kirstytv.